Mandu is an epic setting for an epic love story- the love story of Baaz Bahadur and Rani Rupmati. A love story where a Hindu and a Muslim met and became one in love. A love story in which music brought two souls together. And violence separated them. But all that happened later. In the beginning, there was a beautiful landscape, and there was joy. Mandu was a huge fortified city. Some historians say that it was the biggest of its kind. It was spread over 42 square KM. A number of gateways allowed entry from various sides. Remains have been found of an older fortress, which is locally known as budhi Mandu, or the ancient Mandu. According to a legend, Mandana, a gold smith discovered the paras pathar, the magic stone for making gold. He gave it to the reigning king who named the fort in the honor of the goldsmith. Both the budhi Mandu and the fortress wall, however precede the coming of Islamic emperors to Mandu. 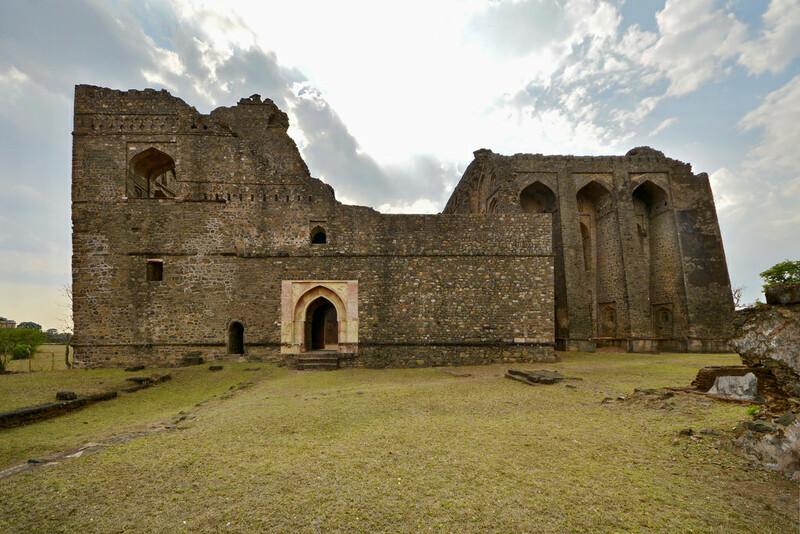 Hindola Mahal or the 'Swinging Palace' heralded the classical phase of Islamic architectural activity at Mandu. It is a very unusual creation. It creates the illusion of swaying like a swing, but is extremely stable – in fact, far more stable than structurally required for this modest sized building. Interestingly, both its ‘swing’ and ‘stability’ arise from the same cause: the six massive, sloped buttresses with deeply recessed arches. Malwa had been under the rule of Delhi Sultans ever since Ala Ud Din Khalji annexed it from the Parmar dynasty in 1305 AD. Timur’s plunder of Delhi in 1399 may have proved disastrous for that city, but it was Godsend for the governors of Malwa. With the Delhi sultanate shaky, they knew that it was their chance for establishing their monarchy in the region. Dilawar Khan Ghuri, the Governor of Malwa, laid the foundations of his own dynastic rule at Mandu. Hushang Shah Ghuri, the creator of Hindola Mahal was the son of this Dilawar Ghuri. It is difficult to guess the purpose of the building from its design. But it is likely that the building served the purpose of a durbar or audience hall. Hindola Mahal is a part of the Royal Enclave of Mandu. A palace with palaces all around. Hindola Mahal was just the beginning. As they say, agar ibtida aisi hai to inteha jaane kahan hogi. If the beginnings are so brilliant, I wonder what the peaks are going to be. The Jama Masjid of Mandu is inspired by the great mosque of Damascus. It is huge and very impressive. Its construction was started by Hushang Shah and completed by Mahmud Khalji in 1458. The Jama Masjid boasts of a huge domed porch projecting in center, with a number of other domes in the background, as well as some intermediary domes. These domes are the biggest highlight of the mosque. Today, Jama Masjid has lost some of its softer decorative elements - the chajjas and the coloured stone decorations. But the mosque retains its stately air. It remains as grand, as beautiful, as awe inspiring as when it was conceived. Just behind the western wall of the Jama Masjid, stands a lavish tomb. 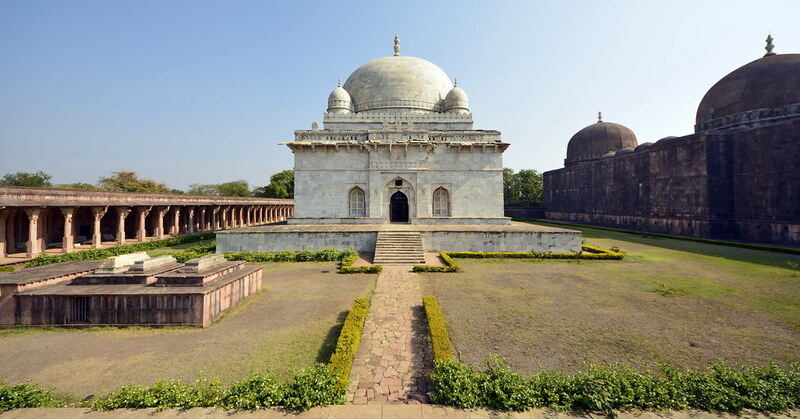 It is the tomb of Hushang Ghuri, a man responsible to a large extent for Mandu’s glory. Hushang Shah Ghuri’s tomb is made of white marble, but not of a very high quality. Hushang Shah wanted to turn his death into a celebration in marble. He commenced the construction of a stately mausoleum as his final resting-place. However, the celebration never happened. Hushang Shah died while the construction was on. He was laid to rest in the unfinished structure. The structure was completed 5 years later by his successor Mahmud Khalji in 1440. Mahmud Khalji was not unduly concerned with things like aesthetics and construction quality, as far the tomb of his predecessor was concerned. However, according to a local belief, Hushang Shah was not actually buried here and his grave is just a dummy. An analogy to the dummy graves of Taj is obvious. Though the tomb does not have much architectural significance to speak of, the sheer fact that it was made entirely of marble lends it a significance. Perhaps that is the reason that when Shah Jahan decided to build the Taj, he sent his architects to study this mausoleum. It is probable that the idea of planting four small domes around the central one in the Taj Mahal might have been inspired by this tomb. 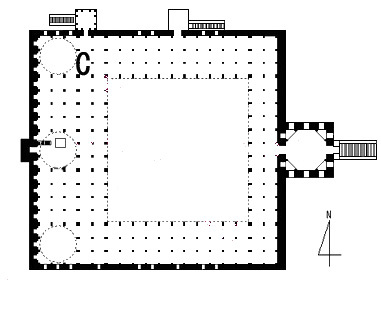 A building exists in the west of the tomb in the complex itself. It is widely believed to be a dharamshala. With Hushang Shah Ghuri dead, and the new dynasty of Khaljis on throne, the political situation in Mandu underwent a major change. The passion for building beautifully, vanished along with the Ghuris. What remained was a mere shadow of that former passion. Today the final resting-place of Mahmud Khalji- Ashrafi Mahal or the ‘Hall of Golden Mohurs, no longer looks like a place where a sultan would like to stay, even for a night. Asharfi Mahal was intended to be the greatest monument in Mandu. But Intentions have a habit of rarely coming true. The greatest thing ever done by Mahmud Khalji remained his renaming of Mandu as Shadiabad- the city of joy. His construction of Asharfi Mahal came nowhere near it. A major part of his life was spent in the battlefield. His enmity with the Rajput chieftain Rana Sanga is stuff of legends. His tomb shares the compound with his other architectural ventures- haft manzil and the madrasa. Haft manzil is supposed to be a victory tower. Only one storey survives now. It is said that during his stay in Mandu, the Mughal king Jahangir used to spend a lot of time here with his consort Noorjahan. The royal mortuary chamber erected in the center of the courtyard is now in complete ruins. Only fragments of the tomb chamber remain. However, the grand flight of steps in the west which lead into the monument still has that extravagant look about it. In the heydays of this building, each wall was faced with white marble, and the doorways, windows and cornices were elegantly carved. In certain places patterns were inlaid in choicest stones with friezes of blue and yellow glazes. Jahaz Mahal, a long two-storeyed structure, is a beautiful palace situated in the beginning of Royal Enclave. It was the beginning of the end for the great Malwa architecture. Jahaz Mahal earned its name by being located between two beautiful water bodies – the Kapur or Camphor Talao and the other Munja Talao. It is believed to be the harem of Ghiyas Ud Din Khalji. However, if the legends around the king are true, Jahaz Mahal is too small to be his harem. He is said to have as many as 15000 wives, all of whom were between 18-30. It is also said that he had employed five hundred Turkish and five hundred Abyssinian women who formed the security ring around him. It is said that he was poisoned by his own son, Nasir-ud-din. Nasir Ud Din was never pardoned by the public for this act. Ironically, the Mughal king Jahangir, who himself waged a war against his father Akbar, was the one who desecrated Nasir Ud Din’s tomb and heaped indignities on it. The lower storey is divided into halls, corridors and a beautiful bath. Pavilions and kiosks are on the roof. In contrast to the Hindola Mahal, the Jahaz Mahal is softer and more refined in character. At the southern end of the Jahaz Mahal are the remains of a complex system of waterworks called Suraj Kund. It at one time must have been equipped with devices such as Persian wheels. A broad flight adds to the liveliness of this substructure. It has domed partitions on the terrace that resembles a high floating hull with cabins on the deck and a captain’s bridge overhanging the middle. Jahaz Mahal marked the beginning of a different kind of architecture. It can be called an equivalent of the modern day farmhouse architecture. An immense love for pleasure and luxurious life marked this phase of Mandu architecture. The buildings during this phase took the form of palaces with Turkish baths, pavilions, summerhouses, fountains, etc. A number of these structural ruins are lying just next to the Hindola Mahal. According to the local belief, they are the ruins of a palace called the Shahi palace. But the indications are that they were not the part of the same monument. Among these ruins are Champa Ki Baoli, so called because of the belief that its water used to smell of the champa flowers. A theatre from these times also exists behind Champa Baori. Another important monument in Mandu is known as Gadashah’s shop or gadashah ki dukan. The name suggests that it was some kind of a medieval counterpart to the departmental stores, Actually Gadashah ki Dukan was a place from where Gadashah a powerful Rajput chieftain used to give public audience. The massive arches give this building a larger than life appearance. Gada Shah literally means Beggar Master. It refers to Medini Rai, a servant of Sultan Mahmud the 2nd, who rose to become a noble of great power. He had helped the sultan in repelling the attack by the Gujrat Sultan. This led to a massive increase in his influence. In fact he almost became the defacto ruler of the Sultanate. Sultan Mahmud was alarmed by his growing popularity. He got the help of the Gujrat sultan and destroyed Gada Shah. The Malwa Sultanate was standing on the verge of its downfall. But before the downfall, there was the love story. Baaz Bahadur’s palace was actually built by Sultan Nasir Ud Din Khalji. Baaz Bahadur, last independent sultan of Malwa sultanate, only renovated it. The love story of Baaz Bahadur and Rani Rupmati underlines the fact that the two great religions were interacting at various levels, be it politically, sociologically, architecturally and indeed romantically. There are several versions regarding how the lovers first met. But whatever the circumstances of their meeting, it definitely would’ve been a musical encounter. In his early days as a sovereign, Baaz Bahadur had suffered a crushing defeat at the hands of Rani Durgawati. After this defeat, he had given up on fighting and concentrated on music instead. By the time he met Rupmati, he had become one of the most accomplished musicians of his times. Rani Rupmati sang beautifully. They used to compose together and sing together. Who Rani Rupmati was, is not clear. She is believed to be alternately a daughter of a Rajput zemindar, a nomad and a courtesan. It is said that her skin was so clear that if she ate something, it showed inside her body. Rupmati’s pavilion is another structure connected to the love story. Rupmati, it is said, was a devotee of the river Narmada. She used to watch Narmada from here on a clear day. When imperial armies of Akbar attacked Mandu, Baaz Bahadur fled and Rani Rupmati committed suicide to save herself from dishonor. The love story of Baaz Bahadur and Rani Rupmati had a tragic end. So did the city of joy. Today Mandu is a city of yesterday, its buildings telling the stories of a once glorious past. The joy and the celebration of life and love has ceased. The Malwa school evolved its own original features and motifs. The arch with the pillar, beam-high plinths and lofty terraces and well-proportioned stairways. But the usual decorative motifs were absent. No intricate jaalis, no tall and slender minarets, even the domes were more functional than decorative. All these features made Malwa architecture much different from any other school. The sounds and laughter of this ‘City of Joy’ are no longer heard. But durbars, hamams, harems and reservoirs still remain, providing a view of the glory that was.